I first heard about Sucré Sweet shop on our visit to New Orleans in August. The Pastry chef Tariq Hanna had just won TLC’s “Ultimate Cake-Off” so he was all over the local TV news. I really wanted to stop by while in town but time didn’t allow. Then 2 months later I received an email from one of their reps asking if I’d like to sample the goods. What a coincidence…. it was heaven sent. Soon after I had my hands on a selection of Sucré chocolates. We received their Sugar & Spice collection which is handmade for the holidays. 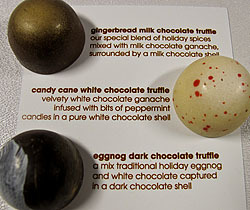 It includes 3 varieties of truffles: gingerbread milk chocolate, candy cane white chocolate and eggnog dark chocolate. Since I’m a sucker for anything eggnog I grabbed one of those immediately. I was worried that the dark chocolate was going to mask the eggnog flavor but it didn’t. It was a perfect silky bite. The candy cane was next and it had a velvety texture with a minty fresh flavor. The final offering was the gingerbread. I knew even before tasting that it would be my least favorite. I’ve never been a gingerbread fan. This was spicy and a bit more dense than the others. Mike enjoyed it but he is a “hot” guy :wink:. 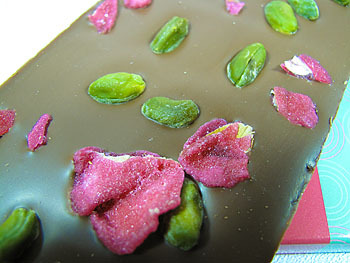 We were also sent a milk chocolate bar with Sicilian pistachios and candied rose petals. I know … really unique combination. It was almost too pretty to eat. The bar itself was creamy and the nuts and petals didn’t add any prominent flavors but it did add a delightful crunch. Good news — I’m not the only one getting a treat this year! I have been given a discount code for my readers so you can also indulge in the Sucré goodness this holiday season. For $5 off shipping use code: SPCA (expires 11/30/09). What makes this deal even sweeter is that a portion of every dollar spent online will benefit the animals of the LA/SPCA. 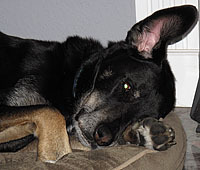 As you’ve seen on our blog we are dog lovers. Our Edison was a pound puppy so we think this is a great way to support a good cause. 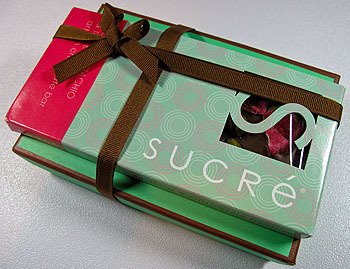 Sucré luxury chocolates would be great stocking stuffers! This was my overall favorite dinner in New Orleans. John Besh’s Lüke is a French brasserie paying homage to NOLA’s past. The decor is bright & simple with a business casual vibe. We were seated in the back room in front of the kitchen. The menu reminded me of Thomas Keller’s Bouchon (which is a good thing). Lots of hearty bistro dishes with a Louisiana spin. Many entrées were calling to me (mussels, steak & frites) but I went with the redfish amandine since it was a more local ingredient. Mike decided on the nightly 3 course special. His meal began with a crawfish bisque, a light and flavorful soup. Then came lamb shoulder in a giant house made ravioli with a tomato sauce. It was delightful. My redfish had a light, flaky, salty crust and a wonderful almond butter lemon sauce. It was perfect. We finished the night with Mike’s third course a pecan bread pudding with vanilla bean ice cream. Simply scrumptious. The only thing that was a little off during our visit was our server. She would come and ask if we needed anything but you could tell her head was somewhere else and she was not really listening to our response. No big deal. I would return in a heartbeat. We went to New Orleans in August because Mike had a convention to attend (not because we are gluttons for punishment!). While Mike was away I had to keep myself busy so I decided to take a cooking class at the New Orleans School of Cooking. Every morning they hold a 3 hour session where you watch local dishes be prepared and then eat them. Our cook for the day was Miss Barbara a native of Louisiana. The menu was a cajun feast: chicken & andouille sausage gumbo, chicken & smoked sausage jambalaya, pina colada bread pudding with a whiskey sauce and pralines. Along with the lesson you learn about the differences in cajun and creole cooking styles and cultures. They may not be the most beautiful or colorful dishes but they sure tasted good. 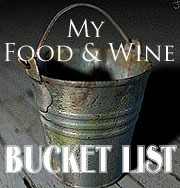 I left with a packet of recipes to try at home, a full stomach and a cold Abita beer. What a wonderful find. Tip: make a reservation in advance and bring a coupon. You’ll find one in the visitors guide. Would I pass up trying a gourmet cupcake shop? Hell, no! The Kupcake factory is a chain in New Orleans and they just happen to have a location down the street from Cochon. By the look of the place I really wasn’t expecting much. The decor/presentation was lacking. We bought 2 cupcakes: banana and hummingbird (banana, pineapple and walnut cake with cream cheese frosting). I was pleasantly surprised with the banana. It was the first time that I’d had a cupcake that is cut in half and frosting is layered in the middle. This made the cake a little messy to eat but worth the trouble. The banana flavor was on point. The hummingbird, although it had a cute name, didn’t taste like anything at all. Conclusion… I wasn’t blown away but, I’d come back to try some more. When I read about a new hot spot in the warehouse district of New Orleans that featured the pig I put it on our list of things to do. Cochon butcher is the tiny sister cafe for Cochon Restaurant. It serves up house made meats in different forms, beer, wine and also has a full bar. We popped in for lunch one afternoon and ordered the pastrami with sauerkraut on rye and the BBQ pork with potato salad. The pastrami tasted nothing like the pastrami I’ve had in the past. Covered in thousand island dressing and kraut the flavor became unrecognizable but still tasty. The pork was smokey, spicy but a bit dry. We are guessing it was a vinegar based BBQ sauce cause we couldn’t see anything. It could have used a little KC Masterpiece. The bread and sides for both sandos were very good. If you’re looking for meat this is the spot to come. I arrived at Cafe Du Monde thinking we were walking into a tourist trap. I expected mediocre food for outrageous prices but knew this is something you just don’t skip when in New Orleans. We sat down at one of the many outdoor tables and a waitress came by and took our order… 2 orders of beignets and 2 cafe au lait. A few minutes later we were covered in powdered sugar and happy as clams. I was soo wrong about this place. The beignets were hot, light, fresh and under $2 for 3! They could be making so much more money – I would pay double. You can’t go to New Orleans and not eat at one of Emeril’s many restaurants. We decide to try NOLA located in the French Quarter. It’s a 3 story building so we needed to take an elevator to get to our table on the 2nd floor. Mike thought this was so cool. The cuisine is an updated twist on classic New Orleans fare. For my main course I chose the shrimp and grits and Mike ordered the hickory roasted duck for his. Our dinner arrived within minutes. No joke…in under 8. It kinda felt like a fast food joint it came so fast. I took a bite of my dish and it was delightful. Cheddar grits with smoked bacon and mushrooms topped with plump shrimp in a creole tomato glaze and a butter sauce. It was a salty, sweet slightly spicy masterpiece. Unfortunately, Mike’s meal wasn’t as good. His duck was cooked well and was smokey but the whiskey caramel glaze wasn’t really there which left the meat a bit dry. It was accompanied by cornbread pudding and a green bean/corn salad which were great. It would have been a knock out dish if only it had more sauce. Maybe they left something out in the rush to get it to our table? As soon as we placed our forks down our plates were whisked away and we were handed dessert menus. We didn’t order appetizers because we knew we wanted to have dessert. We went with the banana pudding layer cake and fancy coffee drinks with liqueur. Both were tasty but nothing to write home about. We paid the bill and were in and out within an hour. The evening felt rushed. It was as though they were in some kind of competition to see how many tables they could turn in a single night. In the end there were ups and downs during our NOLA visit so we left with mixed feelings.